- Lack of PLC resources, e.g. I/O-points, etc. - Long distances between the PLC and field devices. To solve these and other similar matters, remote I/O-Modules are intended. These modules are used in building distributed systems of control industrial objects and processes. They allow expanding these systems by more inputs or outputs of the same types or new types whenever the need arises, to provide more functionality of the system. Among many distributed systems the single-master systems based on serial interface RS485 and Modbus protocol have gained the highest prevalence rates in industrial automation. That’s why the I/O-modules from akYtec feature the corresponding interface and protocol. Besides inputs and outputs, most of modern I/O modules provide many different functions, such as cold junction compensation, scaling of linear signals, wire break detection, safety mode, factory settings restoration, etc. The integration of some PLC functions into I/O-modules is a modern trend. This makes the modules more independent and increases the distribution extent of the system on the one hand while decreasing the CPU loading of the PLC on the other hand. 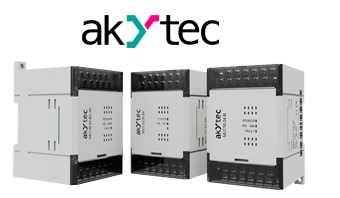 The modules of MX110 series from akYtec are designed to follow the same principle providing a cost-effective and flexible solution for distributed systems. The akYtec modules are delivered in a compact IP20 enclosure and can be operated at -20…50 C. Due to its universal construction the enclosure can be mounted either on the DIN-rail or on the wall. The plug-in terminal blocks enable to remove the device from the DIN rail or the wall without disconnecting the wires. The power supply circuits are protected against overvoltage due to the galvanic isolation. The reverse polarity protection is also provided. The modules are configured through the special PC software (MX110 Configurator) that is available on akytec.de free of charge. This Configurator is universal and is applied to all modules of MX110 series. Any of these modules can be connected to the PC using a USB-RS485 Converter from akYtec or any other similar converter. When the module is successfully connected to the PC, the configurator automatically detects the device version and offers the appropriate parameter set..
All I/O-Modules from akYtec are tested for EMC and meet high criteria of the IEC 61326-1 requirements. This means that the modules from akYtec can be operated under long-lasting electromagnetic emissions. Analog input modules (8A, 8AS) These modules feature universal configurable analog inputs for a wide range of TC and RTD; signal 4-20 mA is also supported. Digital input modules (16D, 16DN)The inputs of these modules can accept DC signals from switch contacts (relays, push buttons, etc.) and from 3-wire transmitters with PNP or NPN output. Digital input and output modules (8D.4R)These modules can process up to 8 input signals from switch contacts and operate up to 4 relay outputs. Analog output modules (8I, 6U)These devices feature 8 outputs 4-20 mA and 6 outputs 0-10 V.
Digital output modules (8R, 8K, 16R, 16K)With these modules you can extend your PLC with up to 8 or up to 16 relay or transistor outputs. 3-phase input modules (3M)Besides the measurement of network current and voltage, the modules of this type can measure active, reactive and apparent power, fundamental frequency and phase angle. Special input modules (1TD)These modules are intended for processing signals from strain gauge transducer.